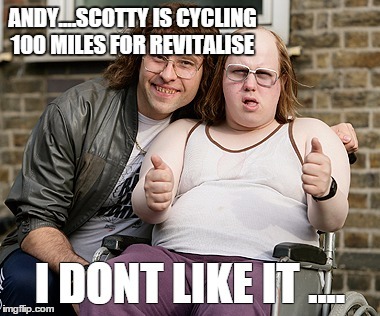 A few sessions on the turbo, trying to get the legs working and they still seem to be sleeping. They need to get going soon as I have a little project planned that will either kill or cure them. But first a gentle spin out to check the bike is in good working order from over the winter, a perfect opportunity presented itself with the annual Surrey Half Marathon which traditionally Woking CC helps out by marshaling on bikes. It was supposed to be a fairly nice day for March, but at 7am when I left the house it was freezing. We got to the start and got radioed up, and we marshaled the runners around the course. There was a lot of backwards and forwards picking up water / sending messages and general helping out. The sun came out later and even tried to warm things up a bit. The race though was a a bit of a one man event. Check out the footage of the front of the race. 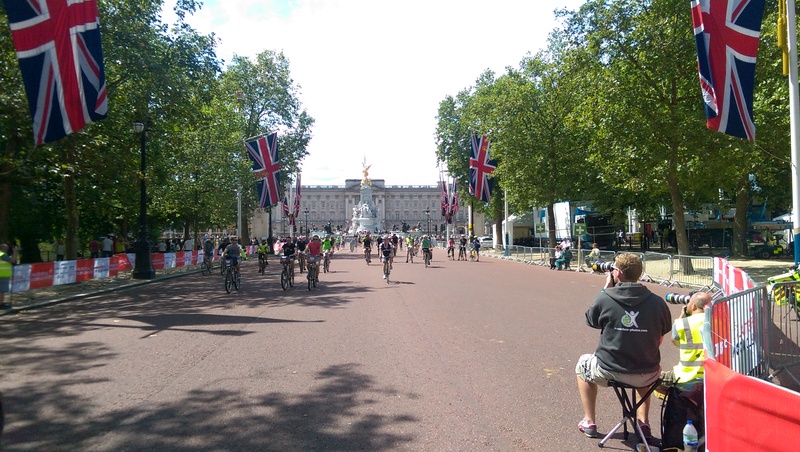 So the time has come again, the weekend of RideLondon is here. Training is done (errr hem – well maybe not enough) this Sunday the legs do the talking. The Italian cycling consultant is riding the event this year, so we have spent the last few days discussing all things bikes, events and training (along with some beer) and keeping a very close eye on the weather. Last year as you can see in the video was a complete wash out. We had spent a day at the expo and picked up our registration packs along with a few photos to mark the event. I also managed not to buy new wheels/clothes/bike and kept my wallet firmly in my pocket. Things are looking good the day before as we take the train up into town. There were a few cyclists on the platform, some for the freecycle event and others for the Ridelondon 100. From Waterloo station we picked up the freecycle closed roads on Waterloo bridge and had a great ride around the center of town. 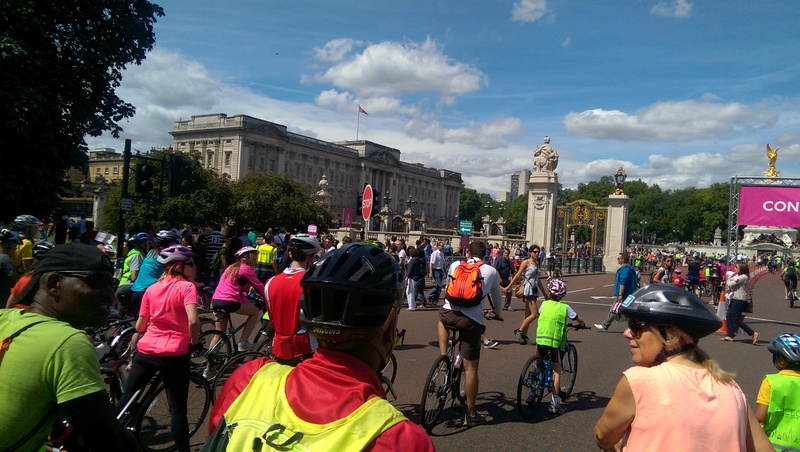 London becomes a cycling mecca. Absolutely fantastic to ride the busy streets of London with no traffic and the roads closed to everything except pedal power. There were a lot more people out this year, 1000s of them and the route was pretty full in places. They may have to think of closing more roads to aleviate the congestion next year. It just goes to show just how many people would be out on a bike in London if they thought it was safe enough. We went out and watched the Women’s elite races the evening before and after the nightmare that was finding a taxi, we eventually got back for some food and to get some sleep. I managed to get a few hours good sleep before the early morning alarm woke me for the early start that is required to get you away before the pro’s. Made my way to the start and without a cloud in the sky it was looking like it was going to be a perfect day. What a difference a year makes. Rolling out the gate, I took it easy for the first 10km and after I had warmed up, the legs felt good, so I pushed on, joining a few mini pelotons and made some good time. I called into Pyrford for a quick water refill and had a chat with the Bike Swanky guys. Then on to the Surrey Hills. The hills never seem so bad when you know where the top is and I was soon flying down to the base of Leith Hill. Up and over and onto Box Hill via Dorking and we were on our way back to London. I managed to get into a similar group along Chelsea Embankment and we made great time back to the Mall, where a little sprint was in order. A great day, perfect weather, great event and the best 5 hours I have spent on a bike.